A fantastic cast brings the hills to life in Rachel Rockwell’s confident Rodgers and Hammerstein revival. Within Kevin Depinet’s majestic set, Cohenour leads the sisters in ethereal alleluias, while the orchestra nails and swings the score. 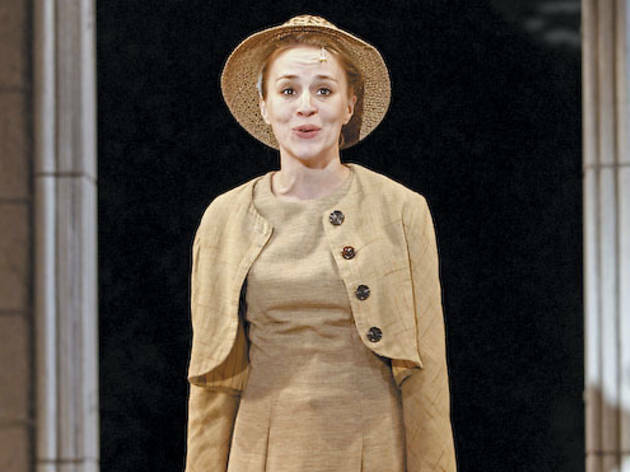 Young pros play the love-hungry Von Trapp children with a refreshing naturalness (notable on opening night were Ben Parkhill as Kurt and, as Gretl, Julia Baker, last seen arresting audiences in Festen). Adams is the full-throated stoic to Blood’s Maria, a comedian with a kangaroo’s spring and maternal sense—she grows up before our eyes, and her expressive singing voice soars. As freshly bedecked with comic moments as it is, this merry waltz never veers far from dread; the final scenes are as tense and beautifully staged as a film noir. No novelty act, the Von Trapp family stand framed against the Alps before the final curtain, a tableau of resistance with unforgettable power.